Amazon’s blockbuster deal to buy Whole Foods Market for $13.7 billion last August was met with much fanfare about lower prices. The internet giant, which has dominated the retail industry by undercutting its rivals, immediately slashed prices of some items after acquiring the notoriously expensive grocery chain. The cost of organic Fuji apples, for example, fell 43 percent on the first day of Amazon’s ownership. The quick cuts prompted some observers to assert that Whole Foods had officially shed its pricey reputation. “The days of ‘Whole Paycheck’ are over,” declared the Washington Post, the newspaper that has the same owner as the grocery, billionaire Jeff Bezos. One year later, though, shopping at Whole Foods will still cost you much of your paycheck – unless you’re an Amazon Prime member. Whole Foods prices have fallen modestly overall, and the grocery is still more expensive than much of its competition, research shows. Whole Foods prices fell 2 percent year-over-year in July, according to Morgan Stanley. A basket of 60 items including fresh and processed goods cost $195, roughly 13 percent more – or $22.49 – than at a typical conventional grocery store. Driving that premium were the grocery’s protein products – eggs, chicken and beef – which were 28 percent costlier than the competition’s, Morgan Stanley’s analysts found. An earlier study by Gordon Haskett Research Advisors found that prices were effectively flat from November to March at a Whole Foods store in Princeton. The price of 108 items fell 0.1 percent, or 40 cents, from $408.23 to $407.83, during the four-month period. A Whole Foods spokesperson did not respond to requests for comment. The chain, with 467 U.S. stores, including on the West Side and in Boise, recently rolled out new perks for Prime members that will give Amazon’s loyal customers special discounts. Consumers who pay $119 per year for Prime can save 10 percent off sale items and some other products at Whole Foods. Prime members can also receive 5 percent cash back on Whole Foods purchases when using an Amazon-branded Visa rewards card. And Amazon included Whole Foods in its Prime Day festivities last month, giving Prime members a $10 Amazon.com account credit if they spent $10 in the store. Some industry analysts say linking Whole Foods to Prime could be a game-changer as Amazon looks to snag a larger share of the $800 billion grocery market. Whole Foods has less than a 2 percent share of the fragmented food retail market. 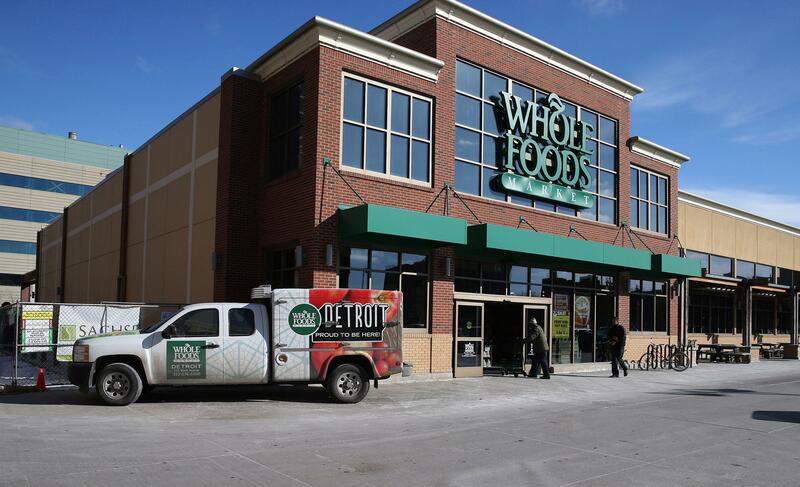 Roughly 62 percent of Whole Foods shoppers are Prime members, Morgan Stanley reported in May. That survey also found that Whole Foods hasn’t shaken its “Whole Paycheck” moniker since the Amazon takeover. About 70 percent of people who don’t shop at Whole Foods say it’s too expensive. Brasler, the Consumers’ Checkbook editor, said Whole Foods is still the most expensive supermarket chain in greater Philadelphia. The nonprofit publication plans to release all of its findings on regional grocery prices after Labor Day. Brasler said Amazon has lowered prices at area Whole Foods stores, especially in the produce department, where it’s now competitive against major chains like Acme. “When you start off 40 to 45 percent more expensive than Wegmans, to lower your prices even by a double-digit number doesn’t do much for you if you’re a shopper,” Brasler said of Whole Foods’ recent price cuts. Brasler said the best way for consumers to save money on groceries is to shop at cheaper stores or wholesale clubs like BJ’s or Costco, if you don’t waste the larger quantities of food. But Brasler says it’s hard to persuade consumers to change their grocery shopping habits. “With supermarkets, people have made up their minds,” Brasler said.